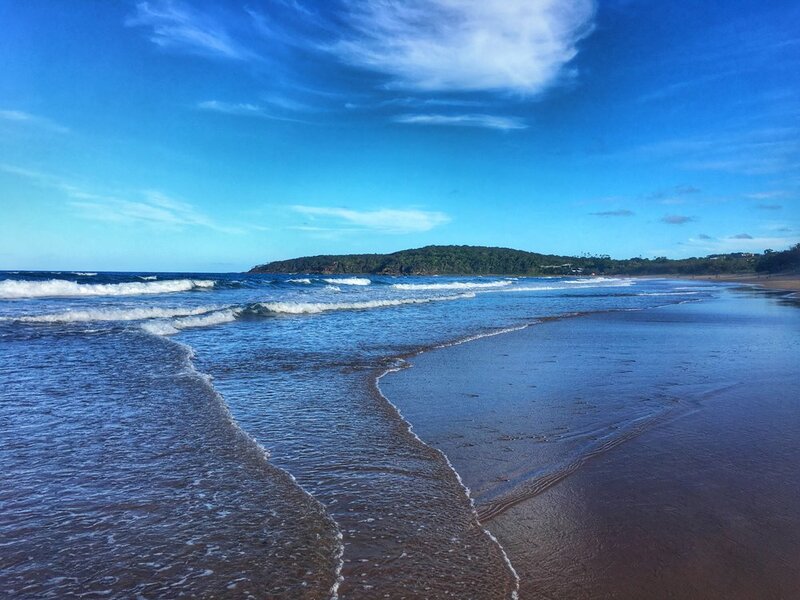 Life's been a bit crazy lately, so I wanted to take a moment to share what I'm doing right now and how things are working out in Agnes Water, while also looking ahead to all the traveling I still want to do this year! I'm in Agnes Water for the time being. It's wet season right now, so there's a lot more rain and clouds than when I was here a month ago, but it usually clears up by the afternoon and the sun comes out long enough for plenty of surfing and tanning. I've actually been pretty busy here. Between getting used to my job at the hostel, applying for other jobs, and downloading books and syllabi for my courses, it's been a bit of a whirlwind. I'm working one hour a day at Cool Bananas hostel in exchange for free accommodation, laundry, surf lessons, and surfboard rentals. I had been cleaning the kitchen at night, but since I am now working at a café in the evenings, I'm sweeping and mopping the rooms upstairs from 10:30-11:30am everyday. Everyone here is awesome and it's so laid back. It's like a little family! Then I work in the kitchen at a restaurant making pizzas, usually from 3-10pm. I'm pretty much responsible for all things pizza… Prepping the toppings (pepperoni, salami, pumpkin, feta cheese, sliced potatoes, and about 15 other ingredients), making the dough and rolling it out, making the pizzas, pulling them in and out of the oven (I usually get one of the guys to do this job), topping the pizzas with garnishes, then plating them or putting them in a takeaway boxes. The shifts are exhausting since it's hot in the kitchen and I'm still trying to learn everything, but I'm getting the hang of things and I really like the staff I work with. I worked five days this week, but from here on out I'll be working four days a week. On weekdays, the pay is $22AUD/$17USD an hour, but then you get paid extra for working after 7pm, which I haven't quite figured out. And then on Saturdays, the pay is $24AUD/$19USD, and on Sundays, it's $33 AUD/$25USD an hour! So, Australia is expensive to travel in, but once you start getting paid in Australian dollars, it's a lot more manageable. So that's what up I'm to right now! I guess it's not super exciting stuff, but my plan was always to work this semester so I could save more money to finish out the rest of my travels for the year. So here goes! I get excited when I think about all the places I still want to travel to this year. The order of this is most likely (definitely) going to change. I don't have a rough idea of how much time I want to spend in each place, which is the beauty of traveling solo. If I love a place, then I can stay for months. If I hate a place, then I can leave after a few days. Wooo, keep working at Cool Bananas, make cash money at the café, and steamroll my last semester of grad school classes. And keep tanning, surfing, and making friends along the way! My dad goes back to the Philippines every few years, and this year he'll be there for three weeks. His brother and sisters still live in the Philippines, so he stays with them. I went to the Philippines with my dad five years ago, and I really want to go back with a new perspective and open mind. So I'll take some time off work to meet him for 10 days, then fly back to Agnes and work for another month. Melbourne has been on my radar since I started planning this year-long trip. I thought for sure I would end up getting an apartment and a job in Melbourne, but life unfolded in a different way and I found myself in Agnes. I have friends I really want to see in Melbourne and I think it's my kind of city, so I do want to spend a month there. My hope is that I can spend my last month of grad school based in Melbourne, then spend a week in Tasmania, which is just south of Melbourne. Early May would wrap up my time in Australia, which also marks the beginning of winter for the Southern Hemisphere. So, good timing on my part. And after grad school? PEACE. OUT. I want to take off to Bali and sit on a beach for a month. Find a little straw hut with an ocean view and just place myself in it. I've been wanting to go to Bali for the longest time, and May is supposed to be one of the best times to visit. Then I've got my fingers crossed for New Zealand! My brother, who lives in North Carolina, is hopefully going to take some time off of work to visit Australia and New Zealand. I want to road trip the South Islands of New Zealand, since I've heard the South Islands are way better (and more beautiful) than the North Islands. And I want to see where they filmed Lord of the Rings! When my brother heads back to work, I'll probably spend a bit more time in NZ, but then it's off to Fiji. New Zealand hills. Credit to @stevenjwilliams. I don't know a whole lot about Fiji besides the fact that it’s a honeymoon destination, but I do know it can be done on a budget and that it's cheaper than both Aus and NZ. So I'll take it. I'll probably do a week or two here. I don't really know, I just put this on the list because it's easy to get to from NZ. And then. The part of my trip that I've been desperately waiting for. SOUTH. EAST. ASIA. For so many reasons. It's easy, it's cheap, it's got beautiful beaches and insane cities, it's got culture and good weather, just SO many good things! I have only been to Thailand and the Philippines, so I'm eager to see more. I want to check out peninsular Malaysia, then hang out for a week or more in Singapore before heading to Thailand. I'm really excited to visit Malaysia and Singapore because I don't really know what to expect, so that makes it more fun! I definitely want to go back to Thailand and could see myself staying there for a month - I want to go back to Koh Tao but also explore the rest of the islands and go north to Chiang Mai, Chiang Rai, and Pai. Then I'll backpack through Cambodia and Laos, two countries I don't really know anything about but they are right there, so of course I have to explore them, too. My cousin has been teaching for a few years in Vietnam, so I really want to spend time with her and get to see Vietnam from her point of view. And finally, I plan to wrap my trip up in Hong Kong. I really want to experience Hong Kong! I have a diving friend who is living there now and I would love to check out the city with her. Chiang Mai, Thailand. Credit to Lonely Planet. I really want to go back to Cairns and work on a scuba diving liveaboard boat. In exchange for cleaning the rooms, washing dishes, and closing bar tabs, you get free accommodation, free food, and FREE DIVES. Done and done. I'd love to do this for up to a month, just to get more diving experience, but I don't know when to fit this experience in. It might be in June or July. At this point, I don't plan to see Uluru (the big rock in the middle of the desert in Aus) or Western Aus. In the beginning, I thought I would make it to both places, but having to stay put for 3-4 months for grad school is a bit limiting. There are other places I want to see besides Western Australia, so unfortunately I don't think I'm going to make it out that way. Australia is just too big! And then from Hong Kong to home. Yes, I still plan to go home! I love traveling. With my whole heart. But I also like having a home base, being near my family and friends, and having a career I'm deeply passionate about. My plan was always to travel for up to a year and then return home. I'm grateful that money-wise, it looks like I'll be able to do that. Wow. Even writing this made me tired. But 2017 is looking good -- I'm excited to see where I go this year! Where are you going this year?! And if you've been to any of these places, send me any tips / places to see!